Matt hails from the Great White North (Halifax, Nova Scotia), and just completed his Master’s degree in risk management from the University of Western Ontario. He has already earned his degree in Political Science from St. Francis Xavier University, and hopes to someday work in risk or organizational consulting. The two months that he looks forward to most are the ones that he spends in Warrensburg, NY at Echo lake as the Head Counselor for the Inter Boys (going into 6th and 7th grade). One of the things that Matt loves most about his role at Echo Lake is the fact that he has seen the same campers grow from their first year as Frosh to today, first as a Counselor, then as a Group Leader before moving into his current role of Head Counselor for all of the Inter Boys. 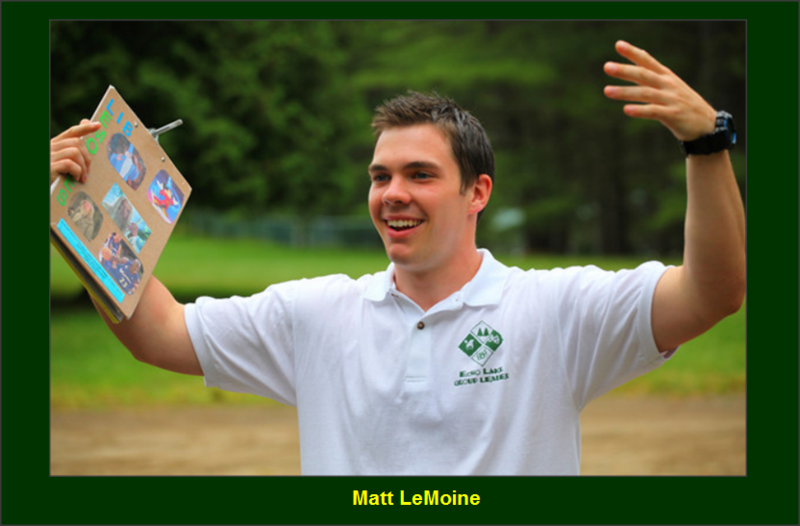 Matt is also an avid planner of all things associated with morning lineup and is excited to share with all of Boys Camp another action-packed kick start to each day. With the help of Patrick McNeece, Matt is hoping to experience another special night of “glamping” and take Boy Camp to another level again this summer. How many summers have you spent at Camp Echo Lake, and what brought you here in the first place? This will be my 6th summer at Camp Echo Lake. After spending four years working at day camps, I was looking to experience what sleepaway camp would be like. After speaking with some friends who had worked at camps in the United States, I decided on Echo Lake because it was a place that I felt acted with purpose and was driven by a core set of values, rather than simply existing as a place to send children for the summer. What was your childhood camp experience like? Apart from a periodic week-long sports camp, I did not go to any sort of summer camp until I signed up to be an “LIT” at a local day camp. Half way through that summer, however, there was a staffing issue and I was asked to finish my LIT year as a full staff member. It was not until I went to Echo Lake that I actually experienced camp as it is meant to be. What do you believe makes Echo Lake special for campers and staff? I feel that the two main components of Echo Lake that make it special are the intentional programming and the constant contact between staff and campers. When I say intentional programming, I mean that all of the activities at camp (regular days, wild special days, evening program, events, etc.) are all backed by a set of principles and values that direct what we do and how we do it. After working on the Head Staff at Echo Lake, I have garnered a new appreciation for how adaptive the programming can be under any circumstance. No amount of thunder and lightning or extreme heat is ever used as an excuse to stop striving to achieve the goals that were set at the beginning of the summer. We just adapt and move forward. Even though the camp is now in its third generation of ownership, there is no resting on the laurels of past summers. In the off season, one of the most regular discussions revolves around how we can change or improve our programming to ensure that campers and staff are getting the most out of camp. In terms of constant contact between the campers and staff, I think that Echo Lake does a great job of allowing campers to enjoy their independence and freedom to make choices in a safe environment guided by friendly and trusted staff members. Echo Lake excels at walking the fine line between too much staff intervention, which would prevent campers from living fully in the moment, and too little supervision, which could create an unsafe environment. How do you spend the 10 months waiting for camp to start? I just completed my Master’s degree in risk management. I like to run, row, play basketball and watch any type of sport. What are your favorite Echo Lake activities? General swim in the lake, Echomania, Challenge Night and MLB Day. One of my favorite memories of camp was this past summer when Patrick McNeece and I took the Lower Inter Boys “glamping” (glamorous camping). We had cooled tents, unlimited s’mores, a movie under the stars and a lot of laughs. It was a perfect night at camp. In my opinion, nothing is better at camp than when everyone totally buys into an activity and they love every minute of it. I also love the Echomania event that is held bi-annually (opposite years of Alawatchakeema). Glenn Begly’s “brainchild” is an all-camp wrestling event (a la Wrestlemania). The most recent Echomania took place last summer, and to me, it was the best one ever. The highlight of the event was when Tony got involved and wrestled Stefano (Senior Village Coordinator). Stefano’s heavy beard had become something of a camp mascot, so legendary in fact, that songs were written about it. At the end of the match (which Tony won), he put Stefano in a chair and shaved the beard off. The campers went crazy with laughter at the whole thing.